The PWO Canada facility at 255 McBrine dr is currently under going a 50,000 sqft expansion. The Grand Valley Institution for Women expansion is currently well underway, I have not had a chance to take photos yet. Quote: The Correctional Service of Canada is expanding Grand Valley Institution for Women to better accommodate inmates. 40 new minimum-security beds and 5 adjoining rooms will be added to a new unit situated outside the fence of the main GVI complex but still on the same property on Homer Watson Boulevard in Kitchener. Media Relations Advisor for CSC, Chantal Guérette, tells 570News this will house female offenders who are classified as minimum security — meaning they pose limited risk to community safety. This will allow up to 5 women offenders and their children to participate in the Mother-Child Program – which helps in the rehabilitation and successful reintegration of female inmates. Decisions will be made with local child welfare authorities to ensure participation in the program is for the best interests of the child. The program was first introduced in 1997. In total, the CSC will be adding 114 minimum security beds to its women’s institutions. 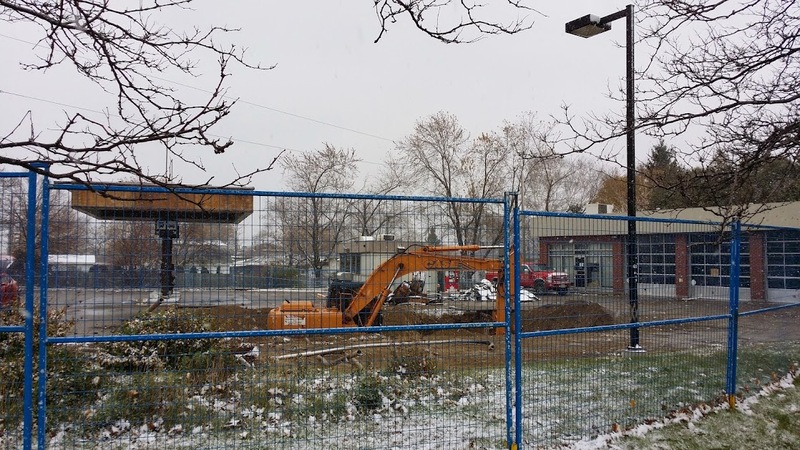 There was a fair amount of activity at the corner of Highland Rd and Spadina Blvd this week where an old gas station used to be, likely just soil testing but hopefully the site of an exciting project someday. The new dental clinic at Hespeler Road and Eagle/Pinebush appears to be open for business. Can't tell if the street-side doors are in use, but the option is there at least. Farther down the road, another gas station has been torn down. No idea what it's going to become (if anything). The house located at 245 Highland Rd has recently been demolished. service’ use on all of the subject lands. further details of the project can be found here. Quote: The recently-proposed Notre Dame school property development is dead. Options for Homes, a non-profit developer corporation, had been interested in purchasing and developing the six-acre site located at 142 Rosemount Ave. in Kitchener, but has now pulled its offer. 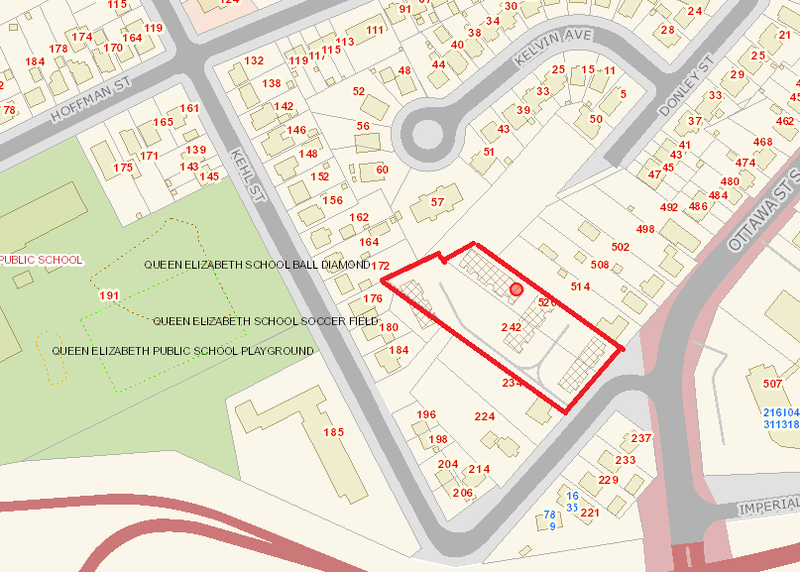 The land formerly housed Notre Dame Catholic School, which was closed in June 2010 and later demolished to make way for a planned 49-unit subdivision that included single family and semi-detached homes However, that deal fell through two years ago. Options for Homes then became interested in the property and securred an option to purchase the land. To get feedback from neighbours about what kind of development the local community would favour, company representatives held a meeting in June that drew about 150 people. At that time, the company said it was considering several different types of condominium developments for the property - either mid-rise or stacked townhouse styles - with hopes that construction could start in 2017. While some people liked the plan for condos, others were unsure saying they believed it would change the character of the mostly single-family home area and cause traffic problems. “Our company has pulled its offer for the Notre Dame property,” said Jan Ciuciura, head of Options for Homes Waterloo Region. “The land is overpriced for the number of units we can put on it according to our benchmarks, and the seller didn’t want to lower the price, so we’ve withdrawn the offer,” Ciuciura said. Although the company had talked informally about its proposal with city officials, the City of Kitchener never received a formal application for development from the developer, according to Della Ross, the city’s Manager of Developer Review. The land is currently zoned for single detached homes. Development of any other type of homes, including condos or apartments, would require a zone change. I saw that what was formerly a "coming soon" Revel sign at the corner of Bleams Road and Century Hill Dr is now a realtors sign. Odd since the property is a woodlot next to the designate Steckle Woods. Between this, the issues with one of their townhouse projects and the selling of the David Street property, could Revel be in trouble? Quote: Habitat for Humanity is dusting off the hard hats. They launched their 2014 build season today. Director of Development for Habitat for Humanity in Waterloo Region, Gerry Lawler says they will be building seven homes in the Kehl Street neighbourhood. He says moving into your own home is transformational for families. He says at least one child under the age of 13 must be moving into the home. This is a rule because they believe the younger generation will pay it forward and contribute to their community. Families are also required to help with the construction. A crane is about to go up next to the Economical Insurance office on Riverbend Drive in Kitchener. This page says there's a 6-storey parking garage going in, so I suppose it's for that. The older of the two Petro-Can stations at Ottawa and Strasburg has been closed, and its tanks are currently being excavated. No word yet if anything is set to replace it. The new parking garage for Economical is well under way. The progress is clearly viewed from the highway. Does anyone know what is planned for the north-east corner of Strasburg Road and Block Line Road? The trees were removed several years ago. Since then they started to dig and then stop. Dig for a week of so and then stop again. They really started to excavate the site this fall but they stopped again. The depth of the hole suggests underground parking for a high rise building but I've yet to see any indication of what is planned. (11-29-2014, 10:56 AM)jgsz Wrote: Does anyone know what is planned for the north-east corner of Strasburg Road and Block Line Road? The trees were removed several years ago. Since then they started to dig and then stop. Dig for a week of so and then stop again. They really started to excavate the site this fall but they stopped again. The depth of the hole suggests underground parking for a high rise building but I've yet to see any indication of what is planned. I live just up the street from this. I understand a highrise is planned but the glacial progress indicates it's on a slow burn financially. Wish I knew more.